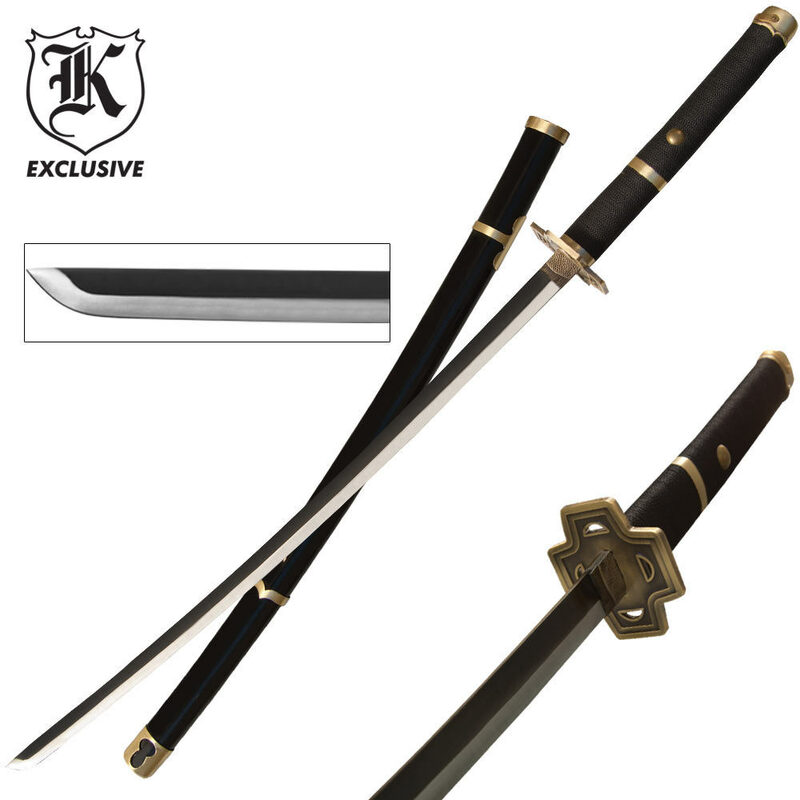 Crafted with anime and manga inspiration, this katana sword offers a handsome harmony of black and bronze finishes. Features include the two-tone carbon steel blade, fine cord wrapped handle, and contoured metal tsuba (guard). The tsuba and fittings are all metal construction with bronze finish, with matching accents along the black scabbard. Measurements: 26 in. blade, 41 in. overall. Blade feels really good to swing around. Took it for a few practice swings and it held itself together, but don't expect to chop a tree in half, for it was not made to do so. I read all the reviews on this sword before buying it and they are correct; the upper piece of the saya fell off at the first draw, it is not razor sharp (not sharp at all) but it is a very good decorative sword, different and beautiful. Do not try to use it as a weapon. By the way... it has nothing to do with any officer or empire; this is a fantasy sword called Yubashiri (snow chaser) and it comes from the One Piece manga and anime series. It is a light beautiful sword for the price. The sword claims to be honed to a razor's edge, yet mine came with a flat blade. The brass piece on the scabbard had fallen of it's spot and ripped some of the scabbard covering. The brass hilt end was also loose. the swords feal and look is great..it is "honed to a razors edge" witch doesn't mean it is sharp or intended for use...overall , if your looking to start a collection, this one was ment to be..if you were looking on using it , well..this one might not be the one. I bought this a while ago, and only recently decided to comment on it. and i was genuinely impressed with the quality of the piece despite it being made of chinese steel. it is, amoung my 13 odd swords, my most striking piece. the brass-y gold on black is an eye catcher. and the blade is razor sharp. my only complaint is that the brass fittings on the saya broke free, and slide around. this was an easy fix by moving them closer to the suba. overall, a simply amazing deal for $30.